Back to my roots. – My thoughts on a page. I have just returned from a road trip, a family road trip in which my younger brother, my mother and I traveled for what seemed like six weeks to Donegal, (it was in reality an eight and a half hour round trip, but you get my drift). We were traveling to a relatives funeral, someone who we remembered very fondly from our childhood days. 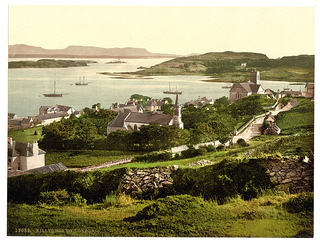 The funeral was in Killybegs the home of my father. It’s a place in Co Donegal which is synonymous with fishing and beautiful scenery. I must admit, despite the sad occasion, I looked forward to seeing it once more, for here I spent many wonderful days of Summer as a child playing with my cousins. This was also the first home in Ireland my mother and father shared, in what my mother and others still refer to as, ‘the little white house on the hill’. They were the parents to two little girls at the time, living a stones throw from grandparents and family. My father was involved in the boatyard, and they were so very happy there. However my Dad was offered a better position in Dublin, which at the time was close to six hours away, and they decided, to see if it would suit. So off he went, leaving a wife and young family behind, to check it out. At a time when fathers were not exactly hands on, my Dad bucked the trend. He was very kind and loving, very much a family man. I can only imagine how hard it was for him to leave. History tells us that the job was what he wanted and so he sent for the three ladies in his life to join him. They would, in time be followed by three more, myself included. I would grow up to consider myself a Dubliner, but forever hold a place for Donegal in my heart. What it took for my parents to leave that idylic spot to move to Dublin, I cannot properly imagine. Here is an excerpt from a letter my father sent my mom, the very last letter he would ever send to ‘the little white house on the hill. ‘Before I began to write this letter I made a point of addressing the envelope, addressed to home, for never again will I write to you to the same address. There is no need to go over all the happy memories, there is no writing pad big enough to write them all in. Soon, very soon we will go, we will go as quickly and as quietly as we can. If houses had feelings we would have to tip toe out and close the door softly to save being heard, but houses have no such feelings, only fools such as ourselves”. “In time we will have a home of our own, and the girls will regard it as their only home, but each time we pass the little white house on the hill, we will remember. We will remember the carefree, happy days, the stormy nights, the view from the window with the moon shining on the water. We will see again tiny hands picking daisies, playing with same, or gently swinging to and fro on the swing with the familiar hills in the background”. Yesterday we returned to my fathers childhood home and drove past the little white house. It is neither little nor white any longer, but passing it I could picture the house we know from old photographs. I turned to look at the beautiful view over the bay, with those hills my father spoke of opposite, and I wondered at how my mother felt, sitting in the front seat, remembering. Throughout the day I carried my Dad in my heart as I breathed in the fish air, as I looked out at the trawlers, as I gazed across at the boatyard, and walked the path outside his home. Later, as I was leaving the church I had a change of mind. Walking against the crowds up to the altar I paused a moment. This was the same church my father had been brought to as a baby to be baptised. The church he had stood as best man to his brother, the day he married. The church he had grown up in. I picked up a candle and lit it. Walking away I smiled as I thought ‘Welcome home Dad, I hope you have enjoyed your visit’. Yes I am back. It’s been a hectic three days. I’ve not been online as such so I’m looking forward to catching up with my reading… if that is at all possible. Being a mother is a pain. Beautiful! I hope to return to Ireland someday. Ireland’s a beautiful place when the rain doesn’t fall. Where did you travel to when you came here? It was ages ago, but The Ring of Kerry, Galway, Dublin… I refused to play tourist and kiss the Blarney Stone. I taught my grandmother the joys of Guinness for lunch (I was 18!) and got to see W Ireland where my dad’s family emigrated from. I remember the warmth of the Irish fondly and will always treasure that trip! Oh wow you saw plenty. Hope you get to come back again sometime. Thank you. My father left school very young and worked hard to continue to educate himself. He was a wonderful writer and I love to read his old letters. The full letter is beautiful, and so poignant now he is gone. Thank you. it’s been some time since I’ve visited your blog (I’ve been away from wordpress for some time). Once again I’m inspired by your writing. You write so beautifully. When you share your dad’s letters, I can tell from whom you you inherited the talent from 😊 lovely! Thank you. Lovely to have you call by. I’m glad you enjoyed this one, especially as it was one in which my Dad ‘guest posted’. Pingback: Irish Parenting Bloggers | Back to my roots. Thanks Jackie. Yes it’s a pity we only get to meet up with family at such sad times. 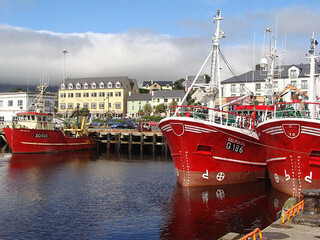 Glad you enjoyed your glimpse of Killybegs. This is beautifully written. Not only can we see what you describe, we can also feel the emotions. Thanks Corina. It was quite an emotional day. It made me want to bring my children there to show them where they came from too. I would definitely try to get your children to go visit, too. Family roots are important to explore and maintain. Do it! Lovely, tric. I see what you mean about your Dad having a talent with the pen. So many folk were forced to flee then, and now still. Dublin probably was the least farthest away but no less heartbreaking. The letters my father wrote were beautiful, and he spoke that way too, with a lot of poetry in his observances, which we often fell around the place laughing at, especially as my mother would cut him down. He might refer to the beauty around us and point out the ‘blue hue of hills on the horizon’ and she’d pipe in, ‘and that fish factory smell is only beautiful too’. They were a great pair. Funny how much we absorb from our parents without realising it. I now point out things to my children and hear them laugh. Thank you. It was lovely to feature my Dads writing here too. Ah Tric! One of my all time favorites of yours at my very first reading of it. I love Donegal dearly! Our last trip there we stayed in the mountains right outside of Donegal and made Donegal our home base for a week riding our bikes in and out and around, walking the streets. Falling in love with the area. Your dad’s words draw me in to his love and nostalgia and tender heart. And fools? Not at all, what a gorgeous heart he has! You share your father’s love for expression and sentiment I see. Wow, reading his words was like him coming to visit us here….. Thanks it was lovely to write his words here. I knew you’d enjoy this one. It was beyond beautiful Tric. We were there in the summer. The only summer trip I’ve taken of the 4 trips I’ve had to Ireland. Beautiful weather all the way through. And the pedaling through the mountains was a workout for sure. 😉 But well worth the effort. We stayed in a 200 year old house. Haunted it was. The owner didn’t like us saying that, but it was a pleasant enough haunting. I think they just wanted to be heard. I love your Dad’s lovely home town. I would gladly go back. And now I’ll always think of him, and his home town. Oh Tric, this is a beautiful and very touching, My eyes got misty reading it. Thank you for sharing. Thank you. I’m glad you enjoyed it. I feel I left a part of me up there yesterday, or maybe took Donegal back with me as I can’t get it out of my head. Thanks Naomi. The full letter is a lovely read. Thanks MM. It’s lovely to have his letters and diaries, as he left us way too soon. Thank you. It was lovely to have an opportunity to share some of his words, pity you can’t hear him speaking them. He’d a very gentle voice with a strong Donegal accent.